We have been researching the causes of various "auto-immune" diseases such as inflammatory arthritis since the early 1980's, when we noticed a change in our own health. What we have learned from several medical and dietary sources, and believe to be true from our own personal experience, is that the cause of such diseases stems from "foreign" protein (usually animal) leaking through the walls of the intestine. The leaking condition seems to be caused by an allergic reaction to some food, which causes an inflammation in the intestinal wall through which the foreign protein can migrate. This simple diet appears to be the most effective way of testing this theory. We have personally found it very effective. We suggest that a health and food diary be kept. Begin by listing the ailments and the aches and pains (all of them). As the diet is begun, keep a list of what is eaten, and update each problem on a daily basis. If the problem is diet related, some improvement should be noticed within 3-5 days. We found some substantial improvement after just 3 weeks. 1 apple washed and cored. 1 or 2 carrots washed with the stem end cut off. 6 parsley sprigs washed. Cut into 1" or 2" pieces and place in container of the blender/juicer. Add 1/2 cup of ice cubes. Cover and blend at high-speed until smooth. Add a little water until it reaches a thick juice consistency. Enjoy! You can also add some romaine lettuce, kale, or broccoli for some variety. Brown Rice Sweet Potatoes or Yams (no white potatoes) Green Vegetables Yellow Vegetables (Do not eat nightshade vegetables such as tomatoes, eggplant, and peppers) Fruit (non-acid) such as apples, pears, and grapes. The Rice and Sweet potatoes provide the calories and protein and satisfy the appetite. 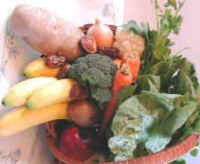 All the foods provide the vitamins, minerals, and enzymes that are needed. For the initial part of the diet, use only salt for seasoning (as little as possible). We have found that the more raw food that is consumed the better. Cook the rice and sweet potatoes, but eat as much of the others as possible in their raw state or juiced, which in the beginning of the diet is probably better. Once you have noticed a substantial improvement in your health, as recorded in your diary, begin to add one additional food every 48 hours, keeping track of the effect, if any. If the symptoms return, eliminate the latest food and let yourself stabilize again. Then begin the process of adding another food every 48 hours. We have found that a consistent vegan diet has prevented most of the recurrence of our own problems. We have found, and many physicians concur, that most of the problems stem from animal products, particularly dairy products. Some people have an allergy to certain grains: wheat, oats, rye, and corn. Some have an allergy to acid fruits: citrus and strawberries. Other symptoms are caused by caffeine-containing foods: coffee, tea, cola drinks and chocolate. Certain oils affect others, including vegetable oils and tree nuts. Refined sugar and white flour also seem to lower the immune system. As you work with this diet, you will hopefully find what is best for you. And remember that stress can cause as many problems as diet. If the symptoms persist, consult your physician.